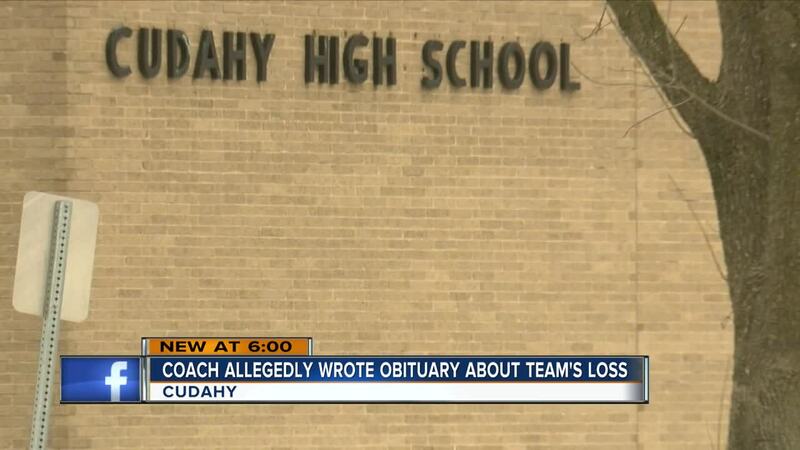 The superintendent of the Cudahy School District confirms the district is investigating a mock obituary about the varsity girls basketball team, allegedly written by the coach. CUDAHY — The superintendent of the Cudahy School District confirms the district is investigating a mock obituary about the varsity girls basketball team, allegedly written by the coach. Dr. James P. Heiden, the superintendent, declined to specify if the post was printed out and handed to team members, or if it was sent electronically through email or social media. At least one relative of a player who was upset by the obituary, which was penned after a loss at South Milwaukee, contacted TODAY'S TMJ4 about it and provided a copy. The obituary is written under the name "Cudahy Girls’ Basketball Team." The superintendent said there's been no change to the coach's status with the district while the investigation continues. On Monday night, some parents at Cudahy High School told TODAY'S TMJ4 they were baffled by the fraudulent obituary. Sarah Verley, whose daughter plays on the team, said she strongly supports the coach and was disappointed that some people were upset by the fake obituary. "He's the best coach Cudahy has, for any sport," Verley said by phone. "He's just a genuinely good person. He cares about every girl. He cares about them personally, and he's dedicated to that team," Verley added. She said her daughter and several other basketball players had no problem with the mock obituary. "I don't know what his reasoning was for sending it, but I know Coach and I know it wasn't sent with any malicious intent," Verley said. "You don't send something like that to them, you go back and fix the problem," said Cindy Bartelt, a parent. Her daughter, 14-year old Lauren, is a Cudahy High School student and athlete. She said she was upset by the coach's alleged writing. "You don't motivate girls like that. It's just going to bring them down," Lauren said. Others, including Lucas Bizub, said, if the coach wrote the obituary, he doesn't think it was done with any bad intentions. "It's just a sense of humor," he said. "I think people need to have a sense of humor about it." "But I think the girls should take motivation from this," Bizub added.